Greetings, my friends! I hope you are doing well! 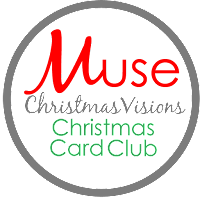 In Blogland this month there are some very special causes and happenings that are near and dear to me ~ and to the world of card art. October is Breast Cancer Awareness month. As I've said in my annual posts highlighting this important cause, it is rare to find someone whose life has not been impacted by breast cancer in some way. When it strikes close to home, we know our cards are a wonderful way to show our support, love, and encouragement. For my card, I used my NBUS Triangle Trio die from PTI. The symbolic ribbon is cut from a Provo Craft die, and the NBUS sediment is from The Alley Way Stamps ("Life is Short"), heat-embossed in melon mambo. The Tim Coffey DSP is from my stash. The pretty sequints are from Pretty Pink Posh. Words 2 Scrap By: Fight Like a Girl. I didn't realize this, but October is also Domestic Violence Awareness month and purple is the representative color for this cause, just as pink is for BCA. 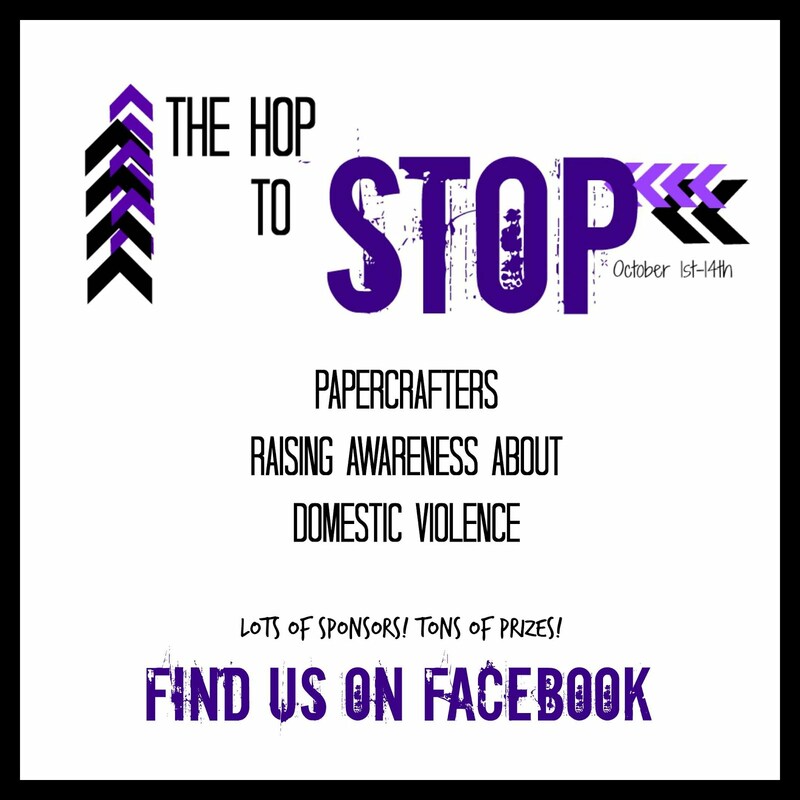 My dynamic friend Becca is hosting "The Hop to Stop" at her place to raise awareness for this worthwhile cause. She's also kindly distributing to women's shelters any cards that you wish to make and send to her. And, there are even sponsors participating! To join in the hop and find all the rules and deets, click on the above link. Thank you, Becca, for being a kind and generous soul! 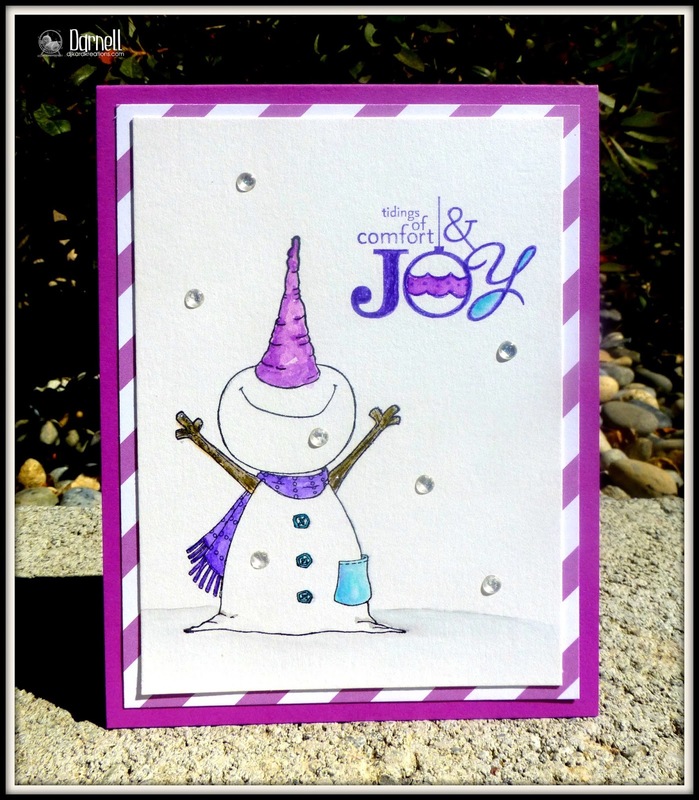 I couldn't wait to ink up this adorable NBUS stamp from Purple Onion Designs called "Jolly!" The papers are from my stash. I watercolored the image with my Ziggies and then winked the colors. The sediment is from SU. I think it is also NBUS, but I'm not for sure. Christmas Card Challenges: Color Combo. Damsel of Distressed Cards: The Hop to Stop. Less Is More: Jewel Colours. Muse: Christmas Visions: Marilyn Cotter. See below. Vera Yates and Jennifer McGuire are holding their annual Caring Hearts Card Drive. Along with a few volunteers, these ladies unselfishly use their own time and money to collect and distribute hundreds of Christmas cards to nursing homes! (You may stand and applaud! They deserve it!) For rules and complete information, please visit either special lady! I'm delighted to have you meet five more fabulous card artists! Purvi Gadewar of Craft Concoction. Purvi started bloggin in 2013. She doesn't get a chance to post often, but I love seeing her craft concoctions when she does. She has been interested in making cards since she was a girl. When you visit, you will find cool and unique inspiration, including hand-lettering and hand-carved stamps! Karen Letchworth of My Cup Runneth Over. Karen has been blogging since 2011. Her range when it comes to designing knows no boundaries. 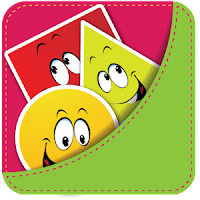 You will find card art, of course, but you will also find oodles of 3D creations, journals, and stitchery. I'm sure Karen is familiar to a lot of you from all of her guest design and design team positions. If not, you are in for a treat! Crafty Hazelnut of My Crafty Outlook. Take your hats off, everyone: Hazel has been blogging since 2007!! That alone tells you why you should visit Hazel and how much inspiration you will find when you do. 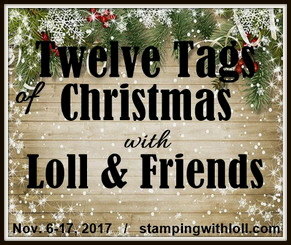 There is always fun going on around Hazel's place as she is also the owner of several challenge blogs! I don't know about you, but I admire and respect a blogger who has been at it since 2007! Marlena McDeavitt of Marlena is Faithfully Crafting. Marlena has been blogging since 2010, so she's also an experienced blogger. 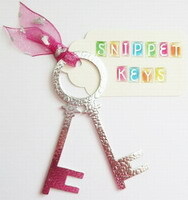 She is the mother of three sweet girls and she enjoys sharing her faith in her card artistry and her blog. Marlena enjoys entering challenges and her cards and 3D projects are always clean and thoughtful! Susanne Rose of Susanne Rose - Paper Blobs. (I'm not sure about the translation!) Susanne has been blogging since 2013. You probably know her from the work she has done on several design teams. If you don't know Susanne, however, I assure you that you'll be impressed by her wide range of artistic talent, jewelry designs, and tutorials! Trust the nursing duties are working and Mister is improving. It is always such a lovely thing to get a card in the post. It cheers us up and lets us know we are not alone and someone is thinking of us. Your Breast Awareness card is absolutely stunning and your snowman card is just adorable. As always, you made me smile big! I too hope Mister is improving day by day and will soon be fit again. Will be missing for a day or two, got the call yesterday, today's the day - Yay! I'll catch up soon. Fab cards Darnell, as usual you made me smile. I needed a little bit of cheer this morning as it has been tipping down yesterday and today. Two wonderful cards for two very important causes. Love them both Darnell. As for the cards for the causes...2 beautiful cards for 2 great causes! Wonderful cards for wonderful causes! These are beautiful! LOVING that snowman on the second one!!!!!!!!!!! Lovely cards for worthwhile causes, D ... LOve that P.O. snowman!!! Gorgeous cards Darnell .... and for such good causes too. Hope the Mister is improving and that your nursing days are coming to a close. That sentiment is perfect for your image - he is so full of joy for the snow falling (obviously he isn't in Toronto at the end of January! lol!) Thanks so much for joining us at MCV this week, Darnell! Third Lee - I'm sure you get soooo sick of hearing it (snicker) but you are AMAZING. Seriously, from the first moment I stumbled onto to your witty, charming blog I knew it would be love at first read. I really like the layout of that first card - I haven't seen it before and it reminds me a little bit of an envelope. Brava! And that SNOWMAN!!! Egads, could a thing be cuter? I think not! Thank you SO much for supporting the Hop to Stop, and for also raising awareness for Breast Cancer. You rock. Love your "cards for a cause." They will surely bring someone great comfort AND joy! Oh my goodness, I came in to see you and was so moved by your links to worthy causes. Then, what do I see? My face! Thank you for the sweet Friends' shout out Darnell. "Experienced"... ;)you truly blessed me and I giggled a little~wish you could see my smile. By the way... LOVE the sweet snowman card and powerful message on your first card. Your snowman is the cutest! Wonderful both your cards, Darnell! The first one is stunning on the design and really love the sentiment, so full of hope! All three are great causes!! 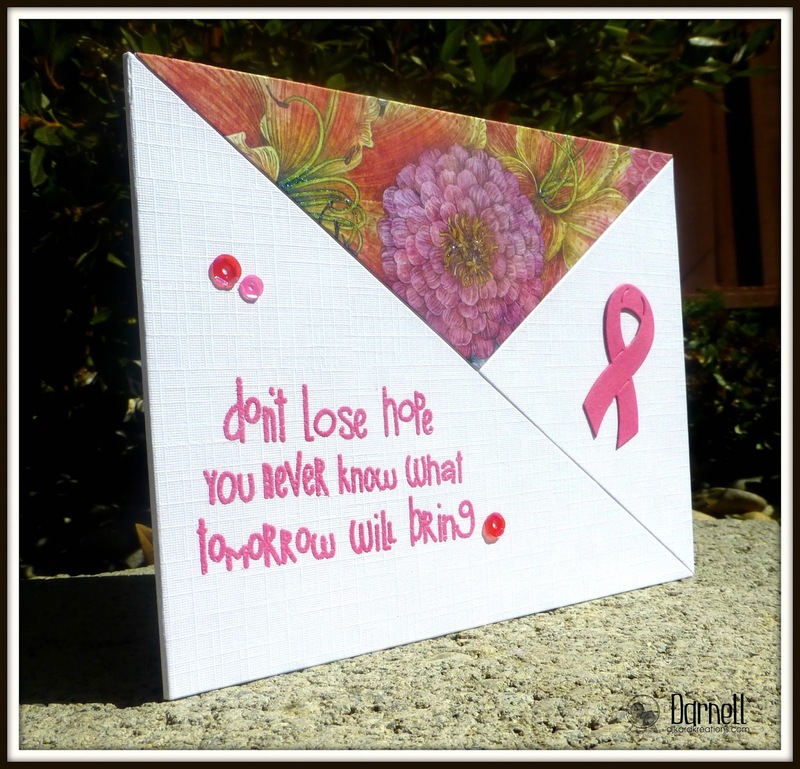 Two great cards for two great causes, and love the sentiments on both cards. Thanks for the "SHOUT OUT", Darnell. I've had a lot of fun playing along here as well, as love meeting new crafty friends. I hope to play along again soon. I also want to welcome you and everyone else to share your creations in the challenges at my challenge blog, Word Art Wednesday. 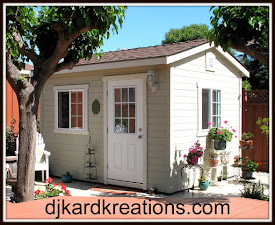 www.wordartwednesday.blogspot.com - we have Anything Goes challenges every week and would LOVE to have you join us! 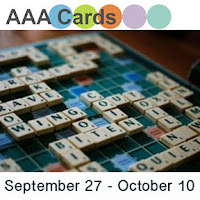 Lots of great opportunities for sharing cards and some delightful cards to share! Love that sediment on the first card and the pretty paper! And that snowperson is adorable! Love all the purple! Hope Mister is recovering at a more rapid rate now. You're awesome, Darnell, supporting both of these worthwhile causes. I love both of your cards but I'll focus on your purple one for the Hop to Stop - thank you for supporting domestic violence awareness. I love your cute snowman and wonderful sentiment - your colouring is so pretty! And you used some NBUS too! AWESOME creations for wonderful causes, Darnell! Love each of the three cards. You truly are a GEM! Thanks so much for playing Simon Says Stamp Wednesday “Anything Goes” Challenge! Two lovelies Darnell - and what great reasons to make cards! Beautiful card. Actually letter with a message of support and assistance, the news that nose up, because everything will be fine. Darnell, this card can restore faith in a better tomorrow. This unusual snowman is so beautiful. Great idea. Popping in for a few seconds! Glad I did too and got to see these wonderful cards - and for great causes! Love them! Love all of the cards, especially the jolly snowman! And I have especially enjoyed your self photos on Facebook! The cross-over card is so pretty, and I love the dsp, but that whimsical snowman just won me over with his cuteness! Great cards for great challenges and causes! Whew! You've been busy my friend! 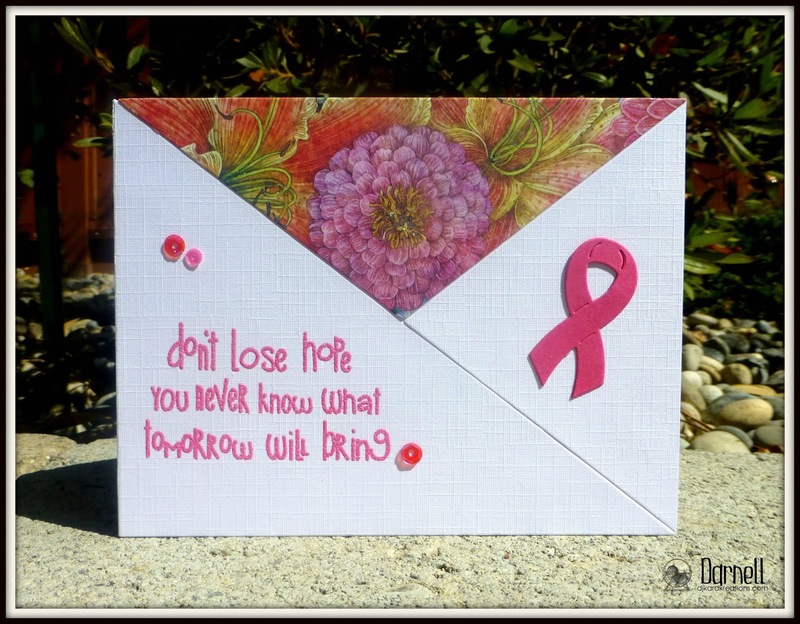 Two fabulous cards for two very important causes! Another great post with some more fab play on words, two stunners here and a very kind and generous person, with your own problems to take the time to care. Two amazing cards, dear Darnell. Your pink ribbon card is super nice. And I really like your LIM snowman. 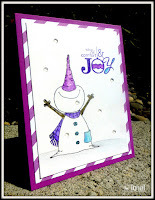 Great idea for a Christmas card to use purple colour. Darnell, I'm so honored that you played MCV and found inspiration from my card. Your snowman is too fun, and I love your colors. Glad things are looking up on the health front. All three are beautiful! it is wonderful to hear of someone who gives to others so much! you are a true inspiration! thank you for sharing your work at the hop to stop! Great post Darnell. I am in love with your snowman...I smell a winner there for sure! Beautiful cards Darnell! I love and have that same snowman,I should have used him. I'm happy to see you have some you time! Hugs! Two wonderful cards for causes, Darnell. I love the sentiment on the BCA one and that snowman is a cutie. Third Lee-You always make me laugh! Hey Darnell. Sorry I have been so scarce around blog land. I am finally getting a chance to come by and see that you are up to your usual tricks--making wonderful cards and spreading cheer far and wide. Thanks for your reminder about special card drives going on now. Always a pleasure to see your cards popping up in the gallery and such an important cause to support too. Thanks for playing along at AAA Cards. A beautiful duo of cards Dippy. I just love your snowman and just might have to go a-hunting in a minute!!! Two pretty cards for two wonderful causes! Your purple nosed snowman put a big grin on my face! How adorable! Love the layout and the sentiment on the first card! Two great cards for two great causes! Your first card is gorgeous and your snowman one with the purple carrot, really made me chuckle! Good to see you and the hamster are doing what you do best...not to say that your nursing skills are stellar, because I'm sure they are. That being said, is your white cap with the red cross on it askew yet? Clearly Hammie is helping to bring some joy during this rough time. Both your cards are gorgeous. The BCA card is truly gorgeous. Kudos, girl. And that snowman. Doesn't he look as though he's just busting a gut because of the snow. I'd go for some of that about now. Take care of yourself while your administering TLC. We want to keep you healthy, you know. What great cards for causes!! I love the encouraging sentiment on the breast cancer card. It is so uplifting and sends a message of hope. Love your silly little snowman with his nose in the air!! Nice job!! I came across your card the other day. You've been busy, as usual. I love the idea of sending cards to Nursing Homes. And as you said, there are very few among us that breast cancer hasn't touched. I know so many of my friends that have had to fight that battle. I hope you are doing fine. Retirement is on hold for now -- perhaps two more years. Beautiful cards Darnell! I hope the Mr is doing better? Beautiful cards, thanks for linking to AAA Cards! Beautiful cards Miss Darnell. The snowman is really cute. Each cause is special one, and your cards are special too! I haven't been around much lately, but it sounds like the Mister is still on the mend. Hang in there! JOYOUSLY FABULOUS Congrats Darnell, you are always a MUSE star to me!!!!!! So good that you made that first card! It is a stylish and super direct card! The snowman on your second is a fun one and I love how you coloured it and gave him "a ground"... Have a colourfull weekend! P.s. Sending some energy to your DH to get better and to you to keep managing all! Hi Darnell--just realized that I needed to amend my comment from yesterday to thank you for playing along at CASology this week. I was sure I had commented on your adorable snowman card, but didn't see it, so wanted you to know I love both of your cards. Thanks so much for joining us at Christmas Card Challenges. Two wonderfully made cards, Darnell! These are both beauties, Darnell, and all the better that they support such important causes. Love the Melon Mambo embossed sentiment on the first card and that POD snowman makes me smile. 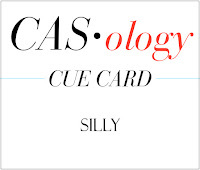 :) Hope all is well with you and thanks for playing along with CASology this week! Hugs! Perfect, perfect cards - wonderful, delightful post!! I hope the pros continue to be on your side!! You and your hubs are in my thoughts and I hope life is treating you good!!! Great cards! Glad to hear a sense of humor in the midst of the stress... Having the pros on your side made me giggle! I'm going to share that with dad, who just had a hip replacement and is progressing, just slower than he'd like. lol. May your hubby's progress be steady and as quick as possible. Have a lovely week! Awesome cards for two great causes! Love that adorable snowman!! Hope Mister is progressing well. Recovery unfortunately is all too often the pits! But with his wonderful nurse, he's sure to be better soon! Hugs to you both!!! Your cards for the causes are fabulous, glad you are supporting both! Great causes! Beautiful BCA card and wonderful sentiment, Darnell! AND, that snowman...could he be any cuter ?!? Such beautiful and positive cards. Glorious cards, and super important messages. 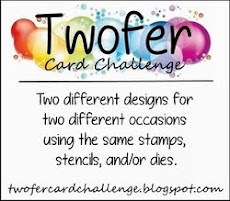 I love your blog and how you feature new card makers on your posts. It's wonderful. Thanks so much for joining us at AAA Cards!